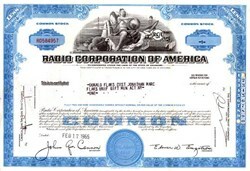 Beautifully engraved uncancelled certificate from the Radio Corporation of America issued in 1967. This historic document was printed by the Security-Columbian Banknote Company and has an ornate border around it with a vignette of an allegorical woman holding a globe, Nipper the Dog looking into an old phonograph horn, a ship, skyscrpaer, space shuttle and the company logo. This item has the printed signatures of the Company�s President ( John Burns) and its Secretary. The federal government's takeover of the wireless industry during the Wolrd War I accomplished two things: it focused efforts and funds on further technological improvements and it sorted out the tangle of patent infringements that had crippled industry development. Wartime experience convinced Assistant Navy Secretary Franklin D. Roosevelt that radio patents should be kept under American control. General Electric, which was planning a major sale of broadcasting equipment to the British Marconi company, was asked instead to take the lead in organizing an American radio concern. GE agreed, and the Radio Corporation of America was formed in October 1919. RCA took over the assets of American Marconi and responsibility for marketing the radio equipment produced by GE and Westinghouse. Conceived as a "marriage of convenience" between private corporations and the government for the development of wireless communication, RCA soon grew in a different direction. Just six years later, RCA's revenues from "wireless" came to $4 million. Revenue from the sale of consumer Radiolas and related equipment had grown to $46 million and the gap was widening. Westinghouse, one of RCA's manufacturers, received the first commercial broadcasting license in 1920. A few days later, station KDKA went on the air with the returns of the Harding-Cox presidential election. RCA was on the air with the world heavyweight boxing championship by the next summer, a marketing brainstorm of RCA General Manager David Sarnoff. Finding these uncancelled is very uncommon since the certificates were turned in when the company was acquired.